SP: Tell me a little about yourself and how you got started with the rescue. How long has it been around and have you been involved. How many folks in your team? Where is your based of operations? LC: My name is Laura Coulombe and I am a founding member and the Chair of Furever Dachshund Rescue. I started in rescue about 6 years ago when I purchased my first dog from a puppy store. I hadn’t researched the breed very well and began to have house training issues. I came across a rescue designated to the breed (Italian Greyhounds) and I called for more information. They were so helpful that I found myself eager to get involved and help people to learn what I learned the hard way. I still reside with my Italian Greyhounds and love the breed but I grew up with dachshunds so I felt the time had come to move onto another breed that I loved but that had more need for rescue. Furever Dachshund Rescue was officially started on March 1, 2011 and has grown immensely since. We currently have well over 200 volunteers in our organization from board members and fosters to volunteers and transporters. FDR is based in Rhode Island but our board members reside all over the US. Our presence in the rescue world is growing daily and we hope to one day be a major contributor to the end of pet overpopulation and abuse. SP: How do you find the dogs that you wind up rescuing? LC: Most of our dogs come from Southern United States but we do intake many dogs that come from all over the country. The dogs we take in are often found in “high kill” shelters which are shelters that have an incredibly high rate of euthanasia due to the excessive population of unaltered pets. Some of our dogs are owner surrenders that occur when a family member is no longer able to care for their pet. Every so often we take in dogs with serious medical conditions that need massive amounts of vetting (i.e. dogs who have been hit by cars, abused etc.) that we find in shelters and vet hospitals. Dogs who are considered critical are often put to sleep because their owners can't afford the vet bills and after care. In these circumstances, a veterinarian might call and ask us if we are able to pull the dog into rescue and explain that the dog has a very good chance of survival. We do what we can and more often than not the outcome is good. SP: What sorts of events or activities are you and the team involved with to help get animals adopted? LC: We do tons of events throughout the year that occur mostly along the Eastern side of the US. We are also partnered with Petsmart Charities and regularly appear in some of the local stores to promote adoption. Social networking is a huge part of our organization and allows us to be seen by people all over. You will find us on Facebook, Twitter, Pinterest, Web Forum, and our own Blog. Anything we can do to get out there and promote our cause; we try to participate in. SP: I understand that you're looking for more foster parents now. What do you think makes for a good foster parent? LC: We are ALWAYS looking for fosters! Fosters are generally people who have a passion and love for dogs and want to help save them. To be a foster all you need to have is room in your heart to share with a temporary addition to the family. Furever Dachshund Rescue covers most of the expenses and a foster family is asked to provide the basics: food, fresh water, and most importantly, lots of love. Fostering a dachshund in need is one of the most rewarding experiences. 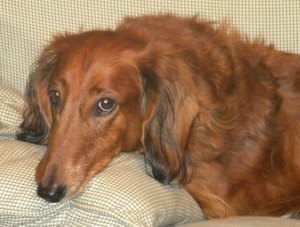 SP: Are there any tips that you'd provide to foster parents of senior dogs generally or specifically for those fostering senior dachshunds? LC: People tend to think that fostering or adopting an older dachshund is more difficult than a younger dachshund but they are often pleasantly surprised to find that senior dogs are much easier. Dachshunds are active dogs throughout their lives and many stay active well into their teens. 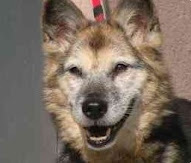 Experienced foster families know all too well that the best dog to foster is a senior because they are already house trained, they have passed the curiosity phase of getting into everything and mostly because they appreciate a snuggly bed, food and water, and all the love you can give them. 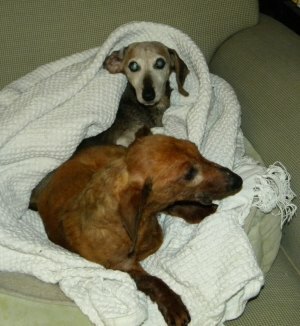 Senior dachshunds are wonderful dogs to foster and to adopt. Thanks again to Laura for all the good that she and her organization does and for taking time to share it with us.